Donata Santori is a police officer/witch working with the recently deceased (ghosts) to help solve cases for the local police department. Usually, this doesn’t involve much interesting work and Donata spends most of her time in the basement of the police headquarters building, doing her summoning and keeping busy with paperwork. After what felt like a routine case involving a trip to a local art museum involving a theft attempt on a centuries-old distasteful painting, Donata finds herself with an unhappy ghost, attempting to convey his worries to her about the piece. Discovering the necessity behind the ghost’s urgency, Donata grudgingly takes on the task of attempting to solve the mystery behind the painting. All too soon, she finds herself in the middle of a precarious and deadly situation involving the ruling heads of government for witches and the extremist Catholic group that has been hunting them for generations. With each organization wanting the painting, by blackmailing Donata, for their personal agendas, Donata has to find a way to appease both sides and do right by her, while trying to keep herself and loved ones safe in this inevitable war brewing between both factions. Seeking help along the way, Donata turns to both a shifter ex-boyfriend named Magnus as well as a half dragon and an uncanny art forger named Peter. Both males have complex backstories that I hope will be explored in future installments of the series. There was also a hint of there being a love triangle and honestly, I’m not sure whose team I’m on. I’m a fan of Magnus’ outgoing and friendly personality but Peter appeals to the side of me that’s into mystery and intrigue. While I don’t want to give away any spoilers (and I won’t), I will say that I was frustrated with Donata on more than one occasion. It felt like she was being too impulsive and less practical about her feelings and actions when it came to romance. While I think Donata is a strong female protagonist, her lack of direction in this and other areas of her life (family, work, etc.) lead to (this) reader frustrations. Donata is also the black sheep of the family as well as the black sheep of the police department. Having turned to a profession her prestigious family is against and working in a police department that is grudgingly acceptant of witches, puts her in an ongoing bad place/state of mind. I believe that at the end of the novel she was beginning to find her place in the world (and acceptance of it) and it translated into her actions–which definitely helped get me excited for another installment in the series. The best part of Veiled Magic for me was the high action and fast-paced plot. While reading, I felt as if there was always something to look forward to; there was constant action on the page, as well as happening ‘behind the scenes’, so to speak. The negative here for me was in the surprisingly quick plot resolution at the end of the novel that I am hoping will be further discussed/explained in future books. 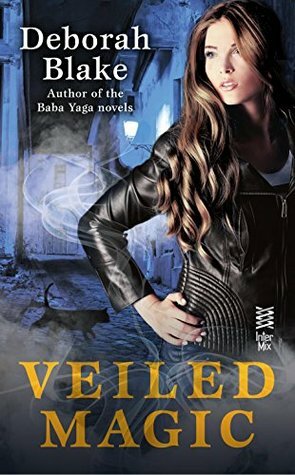 Overall, I enjoyed Veiled Magic and am curious to discover what trouble Donata gets into next. If you enjoy fast-paced plots and urban fantasy novels woven with some paranormal romance, be sure to pick up Veiled Magic. Did I miss the new release schedule email for January?